Three railways have used the route from Dinas to Caernarfon, and a fourth would like to have done so. In 1997 the revived Welsh Highland Railway was built on the trackbed of the former standard gauge Carnarvonshire Railway which had closed in 1963. This railway in turn had been built in 1865 over much of the route of the Nantlle Railway which had opened in 1828 to bring slates from the Nantlle area to the harbour at Caernarfon. The North Wales Narrow Gauge Railway, and subsequently the former Welsh Highland Railway, terminated at an interchange at Dinas where they met the Caernarvonshire Railway, and both suffered commercially from the lack of a direct connection to Caernarfon. Several plans were considered over the years for a new narrow gauge link into Caernarfon along this route, but only with the modern revival of the Welsh Highland Railway was this dream fulfilled. 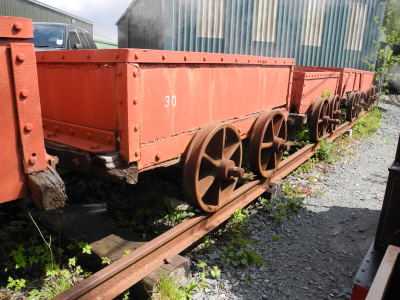 Despite the ravages of time and of the Caernarvonshire Railway, traces of the Nantlle Railway still remain alongside the modern Welsh Highland Railway. The purpose of this article is to illustrate features to be found between Dinas and Caernafon. South of Dinas the railway extended through to Nantlle of course, but that section lies outside the scope of the present article. Some features can be observed fleetingly from the train, more can be seen by walkers on Lôn Eifion which runs beside the railway, and a few of them take more persistence. If you go searching, do please remember that visitors are not permitted on the WHR trackbed. Note too that much more is visible in the spring before the leaves are out on the trees and the undergrowth becomes too dense. The description is arranged in a series of sections following the route taken by the slate trains on the section from Dinas to Caernarfon. Each section is accompanied by a sectional map extracted from the pre-1914 Ordnance Survey sheets.